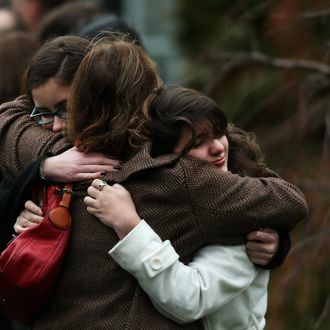 People grieving at Pozner's funeral. Within an hour of the mass shooting in Newtown, according to NBC New York, a 37-year-0ld woman named Nouel Alba posted a message on Facebook identifying herself as the aunt of one of the slain children, Noah Pozner. Later, she solicited donations to help her family pay for the funeral through a PayPal account. This would have been a perfectly understandable request, except Alba lives in the Bronx and has no relation to the child. She was arrested today and charged with lying to the FBI, among, presumably, other things.